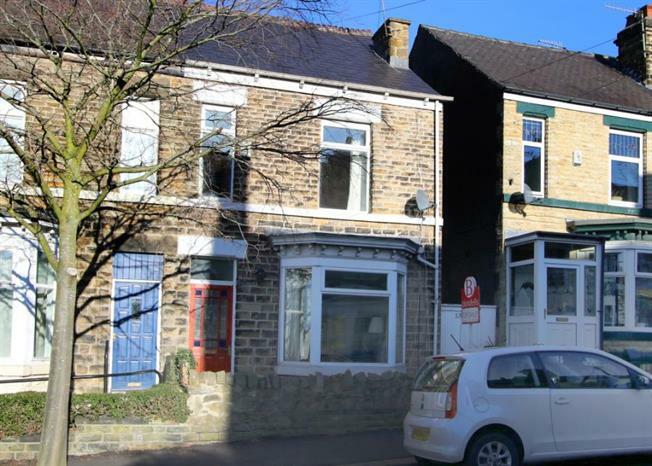 4 Bedroom Semi Detached House For Sale in Sheffield for Guide Price £180,000. Blundells are proud to bring to the market this well appointed, Stone fronted, EXTENDED, Four bedroom Semi-detached property, sitting on the border of the conservation area of Norfolk Park, the property is ideally placed for local shops, schools, amenities and transport links to the City Centre, Train Station and Motorway. In brief the property comprises of; To the ground floor, the entrance hallway provides access into beautifully presented living area with electric feature fireplace and front bay window. There is a further cosy reception room/dining room and stairs lead down into the cellar space. There is a well presented, off shot kitchen comprising of a range of wall base units with roll top work surfaces and integrated electric oven with gas hob. To the first floor is an exceptionally large Master Bedroom, a further second double bedroom, third single bedroom and lovely three piece family bathroom suite. To the top floor is the attic bedroom with en-suite and separate shower cubicle. The property boasts an enclosed courtyard to the rear with a fantastic outbuilding. Ideally suited to a family, couple or investor, an early viewing is highly recommended on this SUPERB home!